Text in English & German. 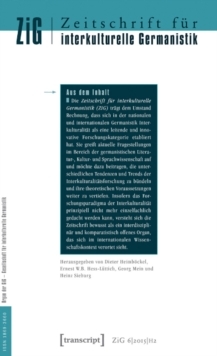 The twice-yearly magazine for Intercultural German Studies (ZiG) focuses on current issues in the field of Germanic literature, culture and linguistics and would help to concentrate the different tendencies and trends of interculturality research and its theoretical premises to deepen. The Special Issue 2015 edited by Natalia Shchyhlevska (Mainz) is devoted to literary multilingualism. It focuses on works by voice changers and bilingual authors and the work Into the first language in the literary language of these texts. The contributions illustrate by way of example models of the interference of the languages in the literary work, techniques of multilingual writing and the contribution of literary multilingualism for the development of aesthetic concepts and the emergence of poetic individuality.